Red is the boldest and most provocative hue on the color wheel. It’s also the complementary color for green. 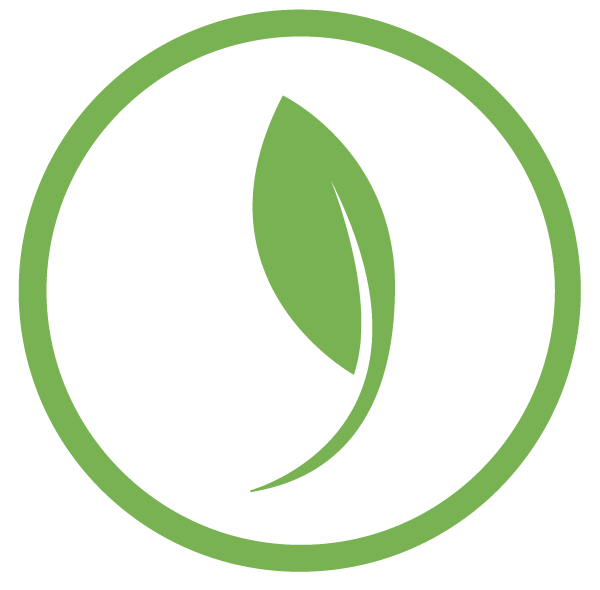 So in gardens, where green is the dominant color, our eyes experience red at its maximum intensity! But don’t let red’s forcefulness deter you. Instead, learn how to take advantage of its strength. 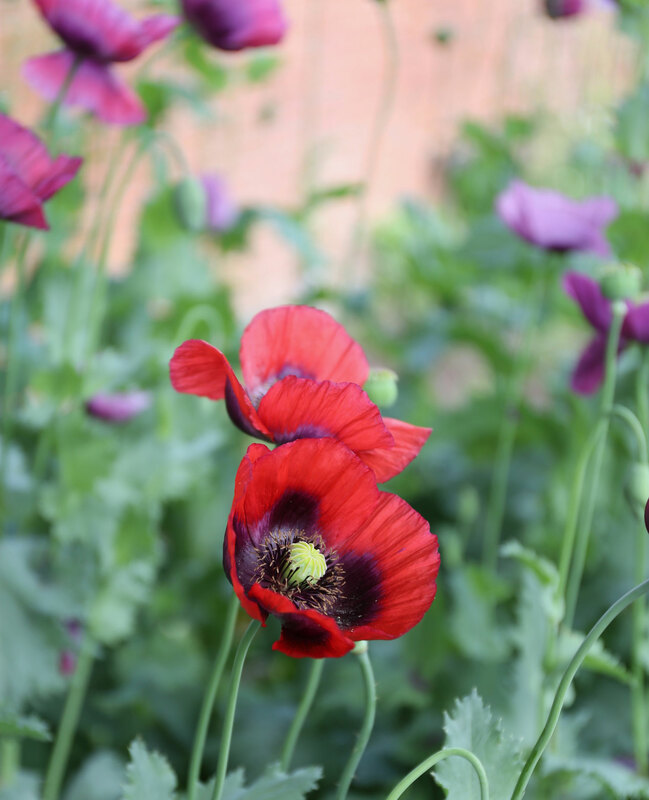 Garden designers know how red pops in the landscape and they typically use it as an element of surprise within a larger planting scheme. Red flowers are placed intentionally and used sparingly — rather like accent pillows in a living room. Yet the color red can be more nuanced. Read on to learn how this warm and earthy color can add a new level of sophistication to your garden. Red is a primary color, and in its pure form it does not contain any of the other two primaries (yellow and blue). As painters know, you can deepen a true red by adding black. This way you retain the same color value, but can get a variety of darker “shades” as shown above. 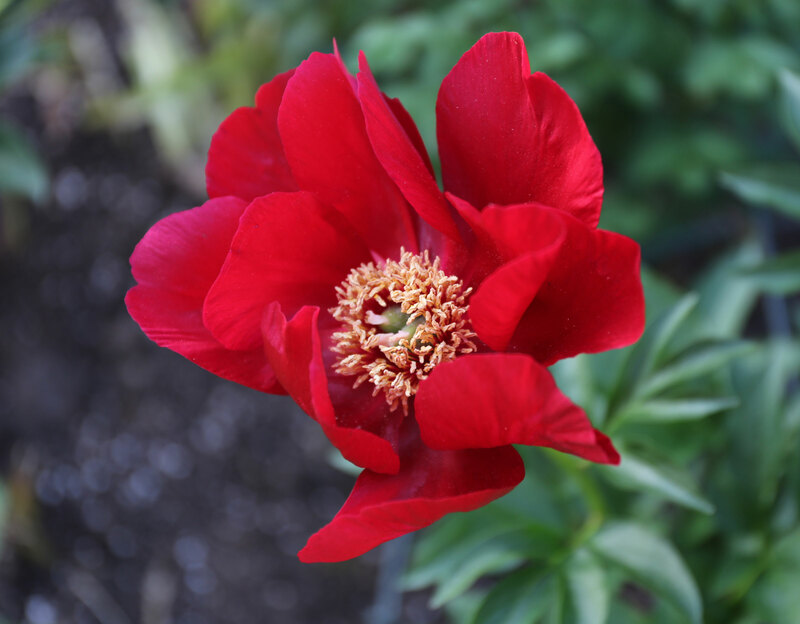 Common names for true red include crimson, carmine and fire engine red. Some of the plants with bright, true red flowers include: Crocosmia ‘Lucifer’, Monarda ‘Gardenview Scarlet’ and cypress vine. Other are Canna australia, Passiflora vitifolia, hibiscus, zinnia and verbena. For spring there are classic red tulips such as ‘Oxford’ and ‘Comeback’. True red can be made warmer by adding yellow. These warm, red-orange hues have names like vermillion, tomato-red and scarlet. The flowers in this color range are are bold and fiery. Examples of plants with red-orange flowers include lantana, corn poppies and trumpet vine. Also geraniums, nasturtiums and the cuphea hybrid known as firecracker plant. When looking for partners for these red-orange flowers, you can always depend on their analogous colors, which include yellow, lime green, coral and burgundy. When you want to emphasize this color’s heat, pair it with orange’s complementary color: blue. 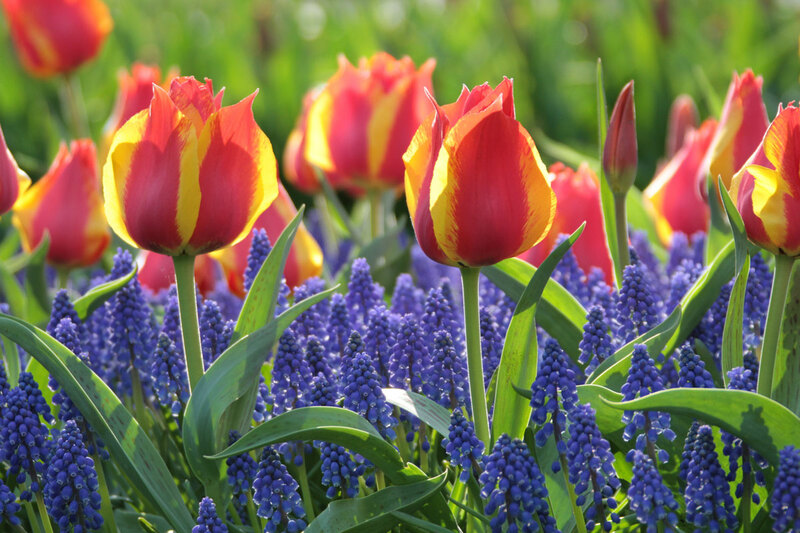 The orange-red tulip Flair combined with Muscari armeniacum. When true red is tinged with blue it becomes more complex and subdued. These colors have names such as maroon, burgundy, currant, ruby, oxblood and russet. Some of the many plants with dark red flowers include roses, nicotiana, Knautia macedonica and chocolate cosmos. 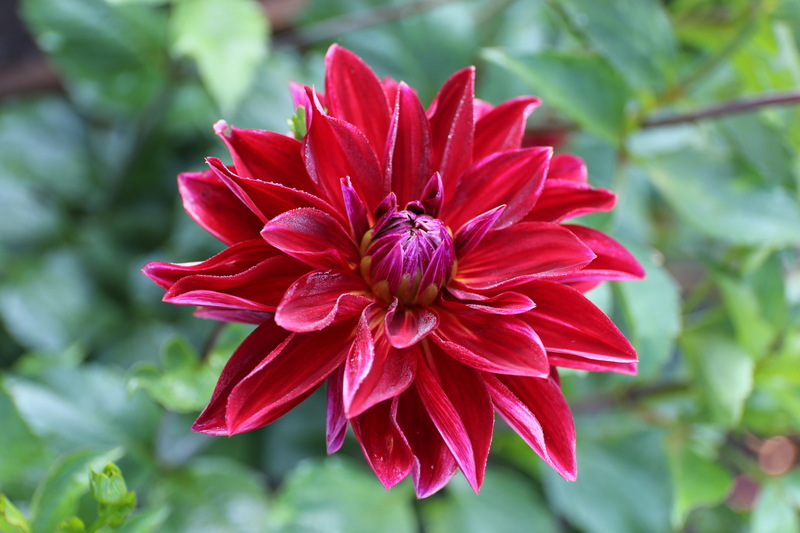 Other options are clematis ‘Red Cardinal‘, astilbe ‘Fanal’ and dahlias such as ‘Karma Choc’, ‘Rip City‘ and ‘Arabian Night’. When you are able to see the “temperature” of a red flower — whether it tends toward warm or cool — it’s far easier to come up with good companions. If you want your garden to evoke a feeling that’s tranquil and serene, stick with flowers that bloom in hues of pink, purple, pale yellow and white. If you want to introduce energy and excitement, you want red in your design palette. 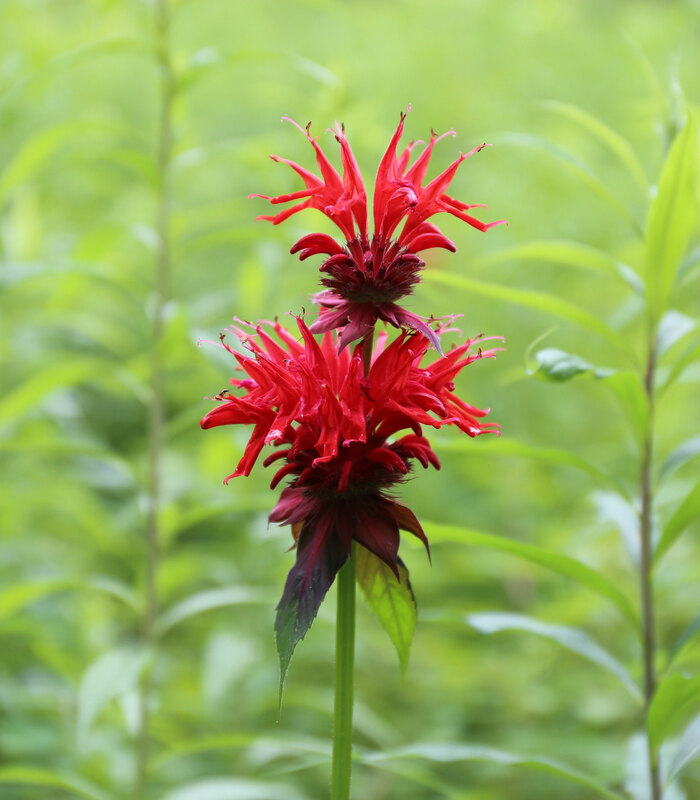 Red flowers stand out from their surroundings and demand to get noticed. 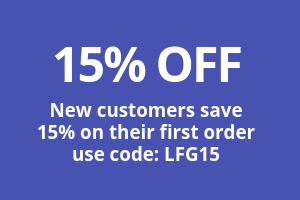 In a large garden, you can use this to your advantage. Red attracts attention, especially from a distance. As you’re drawn closer, that brilliance gradually quiets down and you can begin to see the flower’s shape and form. In a small garden, it’s easy for red flowers to dominate. To contain their enthusiasm, consider confining them to containers. 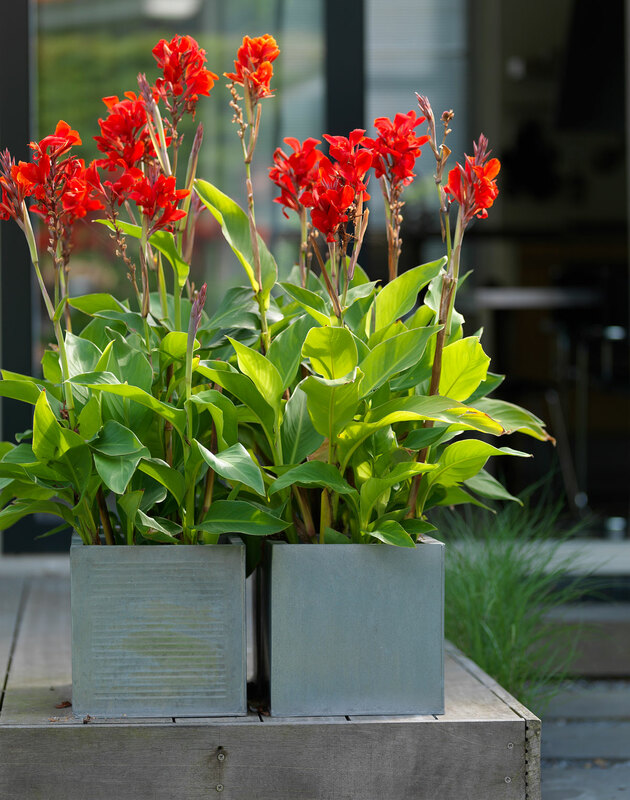 Some good options for containers include: bright red geraniums, red hibiscus, red lantana, cannas and red petunias. For climbers, look to red mandevilla, red cypress vine or red passion flowers. 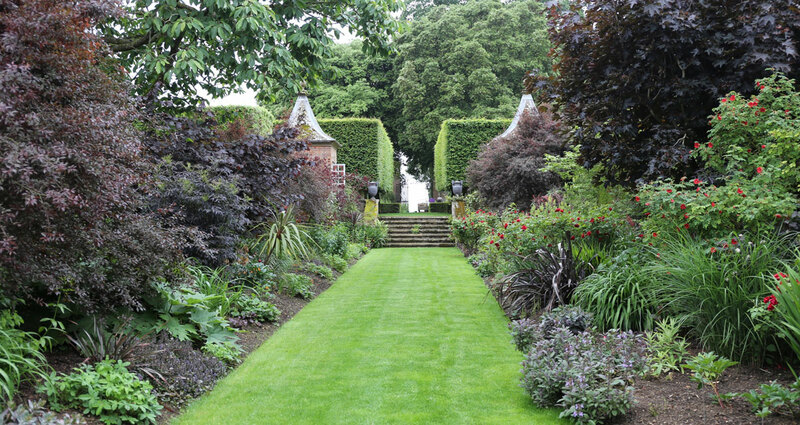 The red borders at Hidcote Manor in England are not as famous as Vita Sackville-West’s white garden at Sissinghurst. But Lawrence Johnston’s daring design from the early 1900’s is both effective and inspirational. These dramatic double borders are a masterful demonstration of how strong, dark foliage can be used to tame and integrate the intensity of red flowers. As the story goes, Johnston’s inspiration for the red borders was a painting by Augustus John, called Madame Suggia. 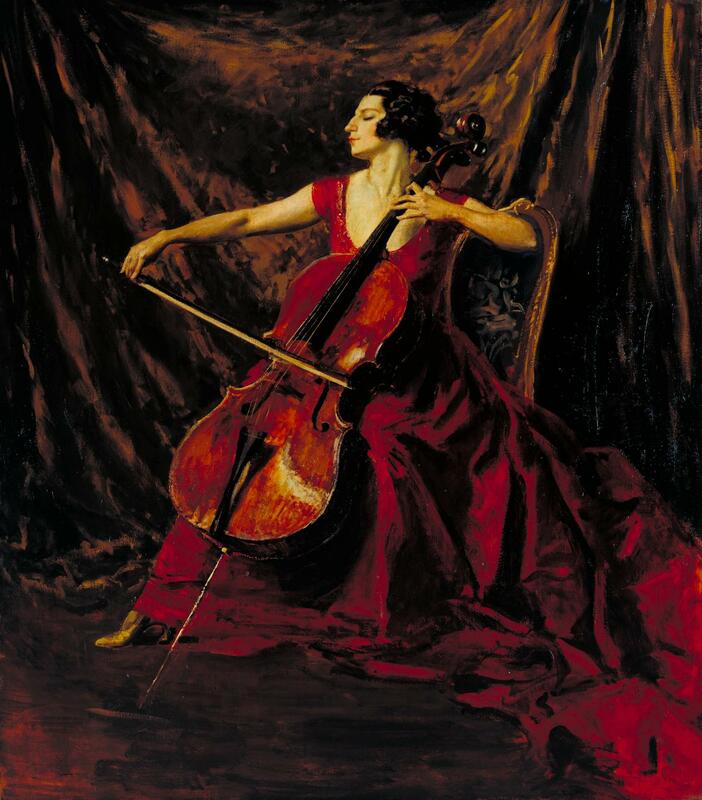 In it, the cellist’s bright red dress is surrounded by a symphony of cool reds, including maroon, russet and burgundy. A color that could have been almost unbearably strong gets tamed by these more subdued red hues. As a whole, the effect is sumptuous and pleasingly harmonious. 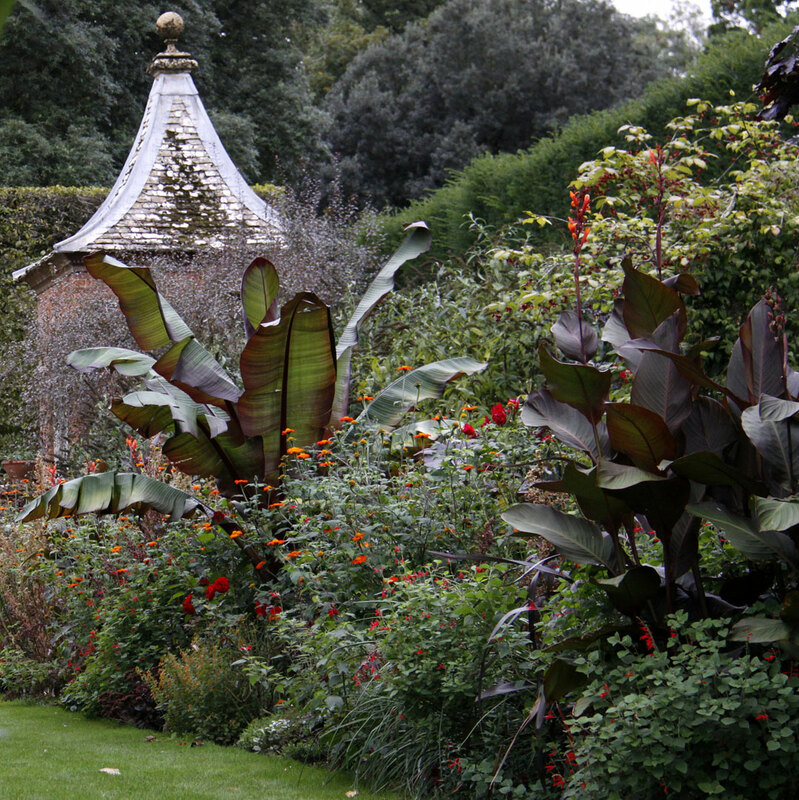 Many of the plants used in the red borders at Hidcote are tropical and it takes until late summer for them to mature. Late summer is also when the annuals and perennials are in their prime, including dahlias and salvias. The photo above was taken in early summer when the herbaceous plants were still filling out. This makes it easy to see just how many dark-leaved plants are needed to balance the intensity of the red flowers. The borders include cotinus, purple-leaved hazel and red bamboo. Other essential players are dark-leaved cannas, New Zealand flax and red cordyline. As with the background colors in the painting, the dark foliage in this garden grounds and cools the reds to create an integrated composition. Not all scientists agree that hummingbirds prefer red flowers, but most gardeners consider it a fact. If you want to lure more hummingbirds to your garden, be sure to include plants with red flowers. Some of their favorites include geraniums, bee balm, cannas, crocosmia ‘Lucifer’, fuchsias, zinnias and salvias. For more suggestions, read Flowers That Attract Hummingbirds. 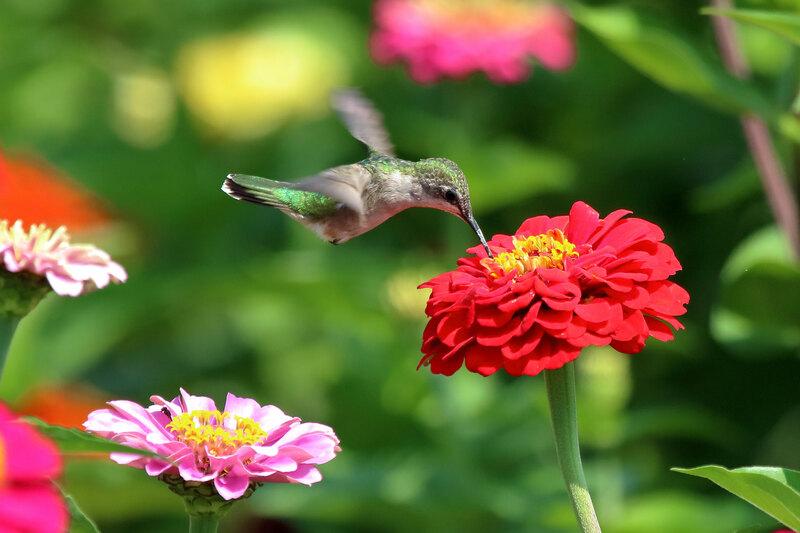 To learn about other ways you can make your yard more hummingbird-friendly, read How to Design a Hummingbird Garden. Red seems to be an emerging trend in garden design. Above is a recent Instagram post from Danish garden designer Claus Dalby. It featured a German garden designed around red flowers. Claus is a colorist and his palette usually tends toward softer hues. But he was clearly taken by the drama of these borders and the images were a big hit with his followers. 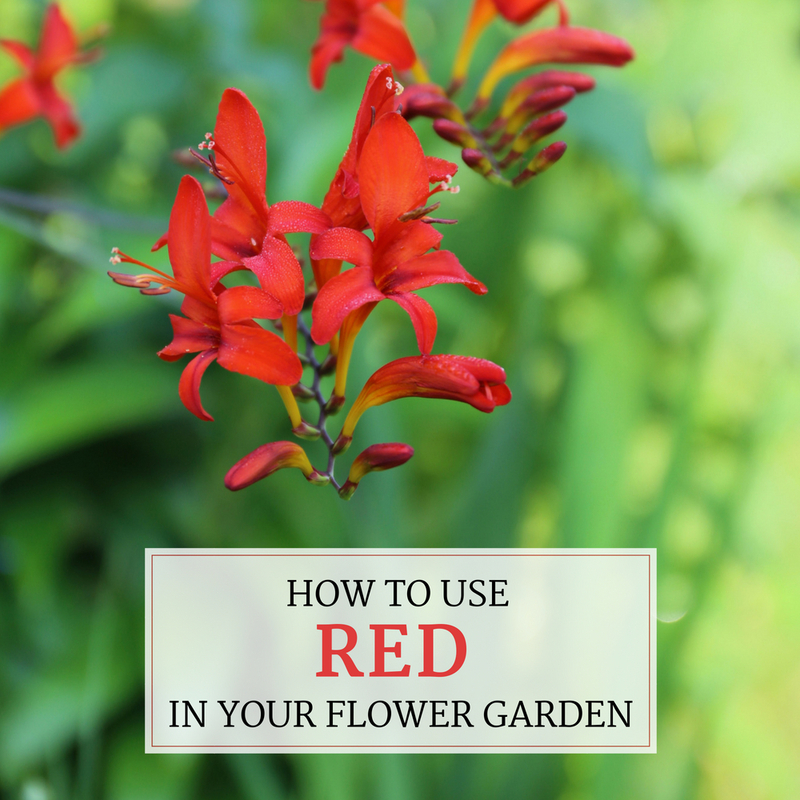 If all this has you thinking about how you might incorporate red into your own flower garden, see below for a list of red flowers and foliage. To learn about designing with other flower colors, you may be interested in reading about Burgundy, Orange, Pink and White.